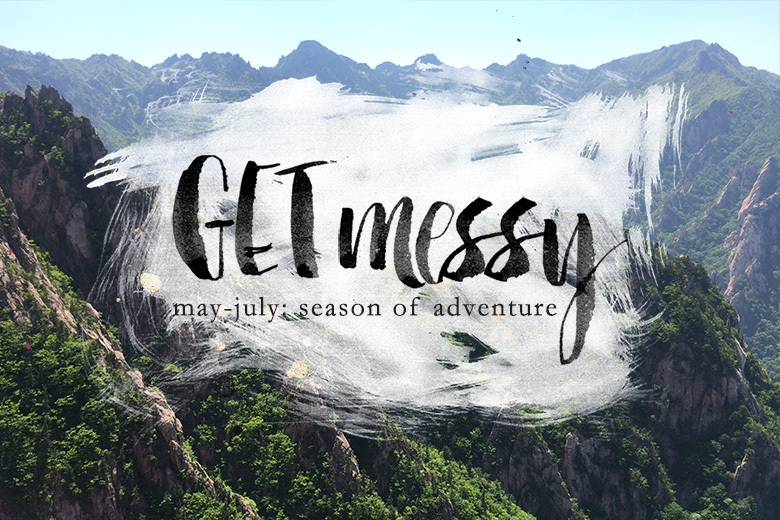 This week marks a new season with get messy art journal - the season of adventure! It is perfectly timed for me as I have just gotten back from my own Japanese adventure and have a TON of things to put into my travel journal. 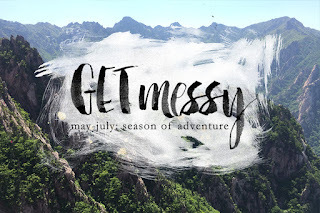 I'm not sure if I will intertwine the two, or if they will co-exist separately, but I'm sure this get messy season will help inspire me to hold on to those memories.. and get planning future travels! The first images I created are a combined little 'mini series'. Our prompt was to focus on a place and word and I thought of when I was in Kyoto last month... I just had this huge sense of wonder about the place. It was awe inspiring and so unbelievably beautiful, tranquil and unlike anywhere I have ever been before. 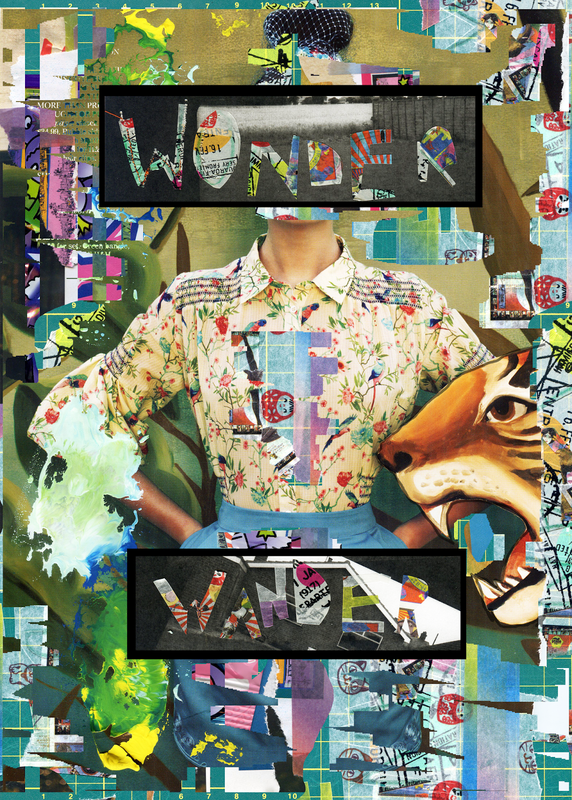 I knew my word would be 'wonder' but I also wanted to couple it with 'wander'. I like the two together; wonder/wander as they kind of lead on from one another and both speak of adventure, travel and feeling. The start of this page came from me trying to transfer an image using PVA and water. It kinddda worked but not really well enough, so i merged it with my restless model and added the paper cranes as I scanned it in. These cranes have been with me since 2007 (!) when I did a uni project based on Sadako Sasaki- if you don't know this story, look into it, it's beautiful. I couldn't get the hang of origami but my friend picked it up real quick and ended up making me loads of paper cranes to present the project with. These three are all I have left and I treasure them. They recently came back into my life as I picked up some of my old uni work last time I visited my parents. Adding the 'wander' seemed fitting as the cranes are for freedom, hope and wishes. I knew that I wanted an actual photograph of Kyoto to be part of this weeks prompts. Using photography in my art journalling isn't natural to me and leans towards a more personal journal, which I am trying to create. 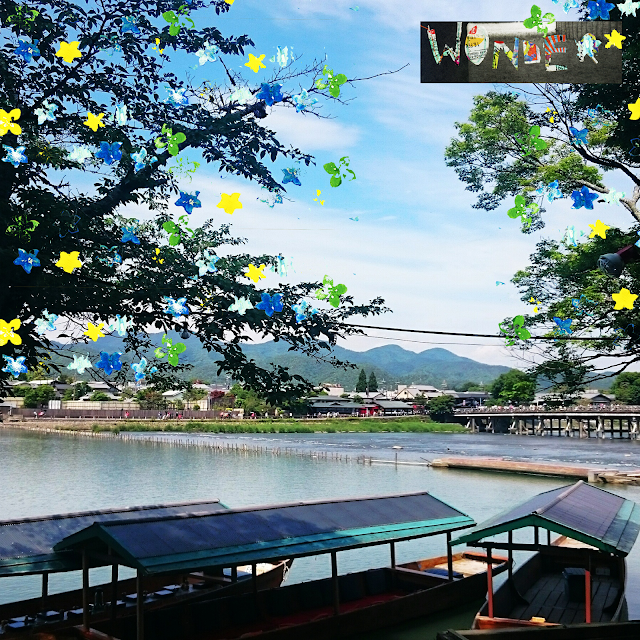 This picture is so perfect to represent my time in Kyoto that I wasn't sure how I could enhance it. I ended up scanning in some of my flower stampings (brought the stamps in Japan - naturally) and collaging them across the trees. I am pretty in love with the effect as you have to almost look twice to see that they're not real! This is a typical 'Julia' art page to me! All the layers, colours and patterns are what comes naturally to me. I like how this image is a bit of an assault on the senses - again, this is what Japan, Tokyo, in particular was like! wow... I love this! Your trip looks like it was so much fun! Thanks for linking to the Make Things! challenge! Thank You! It really, really was :D I like your challenge! I'm looking forward to more :) Oh and I read your career post on Delaney's blog - fascinating !! you should do a little tutorial or guide about how you use photoshop in your pages for us! They look AMAZING plus you'd never know those cranes weren't actually on the page they look so real. LOVE IT!! Absolutely gorgeous, I'm inspired. And also yes to the tutorial idea karen. OMG have just read the Sadako Sasaki story. SO TRAGIC. Oh my goodness. I know, right? It's amazing and traumatic all in one.